Early hires in SAC came with military background and some of them also worked in RCA Earth Station in Pune. It is only in 1970 – 71, ISRO-SAC started hiring people with engineering background from all the Indian institutions. When I joined ISRO-SAC, I came from Regional Engineering College, Warangal and we were the first 26 engineering folks came from different institutions. The earth station was initially built with NEC equipment and NASA provided Application Technology Satellite (ATS) 6 for a year (1975 time frame). The Indian Program called “Scientific Instructional Television Experiment (SITE)” was planned to provide massive education to rural areas. The education included teaching “reading and writing”, “family planning” and “improving the agricultural output”. I was in Systems Engineering group which developed the programs for education. NASA would NOT allow us to beam our broadcast to ATS-6 Satellite without proper specifications of the transmitter and testing. The testing had to be done without using the satellite. This is very similar to a situation when you graduate and you do not get a job without experience. We had to overcome numerous hurdles like this, but engineers from NASA gave exceptional help for us to educate and make things happen, without which it is nearly impossible to achieve everything in a year to ready the transmission. All engineers were able to work together and finally developed the SITE program and it is a major achievement considering the fact that new engineering graduates never had any experience. The systems engineering required writing the specification and develop the transmitter for testing the receivers. We built miniaturized transmitter that include the baseband system, Intermediate Frequency (IF) system and Radio Frequency (RF) system for upstream broadcast with ATS 6 satellite in the future. Similarly, we also had to develop a receiver that included similar components on the downstream. We used to lack the equipment that NASA had and we developed sometimes alternatives for the test to meet the specifications. We developed programs by inviting villagers across different segments and experts in agriculture and social scientific areas. The programs were beamed around 1975 to different villages in India. It became a significant success and paved the way for a rapid growth of satellite communications in India. I must mention that the engineer from NASA who helped me quite a bit was Mr. Jack Miller. The program Director from NASA, Dr. Richard Marsten used to discuss with me prior to the meetings for progress and he knew what exactly was happening. Anytime, I had difficulty, he used to bring his engineers to help the systems group. The first distinct outcome was the fact that the transmitted for testing was build with local components (Indian components) and it enabled us to develop miniaturized transmitter that actually can be used to build a satellite. It improved reading and writing so that villagers can properly discuss their issues of land and legal aspects without hesitation. India produced 3 times more food with the same methods of farming but with proper seeding. This was an enormous and hugely impacted the country. The Television receivers were placed in village community centers or parks, the farmers and their families were forced to go these centers every day in the evening to watch the satellite programming, it impacted their personal lives much more immensely and one statistics that came out of it was the number of intercourses were reduced by 75% and it should have helped controlling the population significantly. The billboards that came about family planning, “we are two and we only need two” came after this program and in 70’s this was spread all over the country. Although ISRO SAC was not involved in building the first satellite (Arya Bhata), I am sure the engineers in Bengaluru must have seen some of the developments in ISRO –SAC, Ahmedabad. 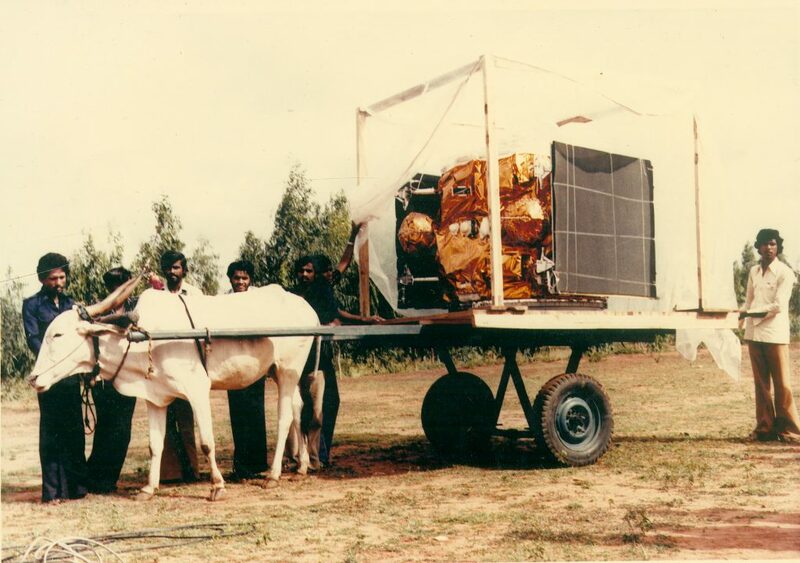 The photograph that became a symbol of poverty and technology, where a bullock cart was used to transport the satellite from the control station to the launching center has nothing to do with poverty. It is just that ISRO did not have a Electro-Magnetic free vehicle to carry the Satellite. The idea of using the bullock cart without any metal was very creative. Someone asked me how did they manage the satellite to be stable when the bullock cart shakes so much while in motion? My guessed answer was that they must have carried ever so slowly to reaching the launching pad. All in all things happen in India and I can only say that there is enormous talent in India that allows many creative ideas to come to the front and with no communications between ISRO, Bengaluru and ISRO, Ahmedabad, at least during ATS-6 program time, they integrated over a period of time. India never looked back and kept moving well in space program. A word of caution – what has been achieved by courageous engineers should never be forgotten and the beginners contributed so much to the growth of Space Program.